A disgraceful row of events, a torn ACL in a ski accident that doctors can´t fix yet because they have found two blood clots in the injury leg, are taking me off for a while of two of my passions: doing exercise and… drinking wine. But as I´m a really optimistic girl, I decided that time for a little indulgence had come. 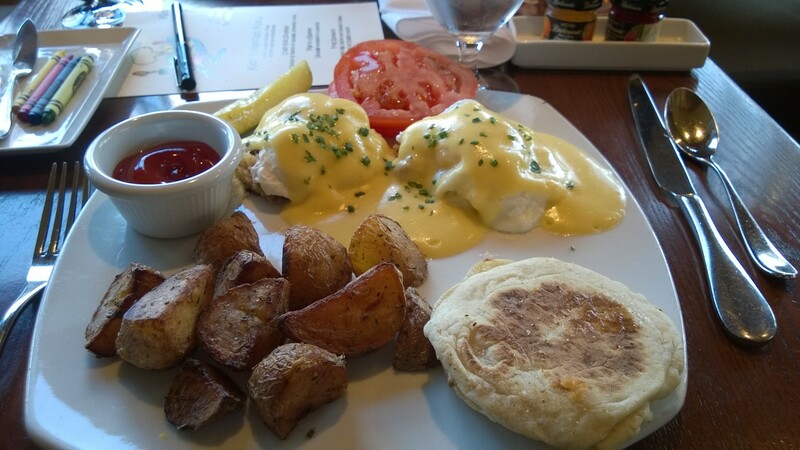 And when I indulge, eggs Benedict are on the top of my list. After having tasted Maltby Cafe ones, huge tasty plate, and Hotel Davenport in Seattle last Christmas, a bit disappointing, I decided to follow 425 Magazine suggestion and visiting The Barking Frog yesterday. This is the restaurant of The Willows Lodge in Woodinville, one of my favorites cities in town. In fact I´ve decided to try for the first time Huevos Rancheros, but I couldn´t help ordering the Dungeness crab cakes eggs Benedict… again. And oh! perfection! I finally found a comforting and delicious dish not too salty, not too greasy, not spicy at all, perfect seasoning not to hide but to enjoy the quality of the crab and the amazing Yukon potatoes roasted with herbs. They rank 1st in my particular Washington eggs Benedict crusade since now. Beautiful place, nice ambience and service too, really friendly with my 6 year old that went tradicional and chose burger slides with fries. Perfectly grilled. The tomato in my plate came from my son´s burger, but I have to say It fits perfectly with the eggs and the potatoes, giving a lighty touch to the plate. Little personal suggestion for the chef… Unluckily I couldn´t enjoy none of the cocktails and wines due to my Health condition, but I promise I´ll go back to enjoy dinner later on when I recover 100%. The Barking Frog and the Willows Lodge, a perfect place to find this sense of pretended isolation and relaxation in a beautiful spring Sunday. Posted on March 24, 2014, in Eateries and restaurants, The yummy chronicles and tagged chef Bobby Moore, Dungeness crab, eggs benedict, The Barking frog, The Willows lodge. Bookmark the permalink. Leave a comment.